Precious metals markets enter 2019 with an opportunity to shine. Several major bullish drivers are lining up to start the New Year – including technical, fundamental, monetary, and political drivers. Before delving into each of them, let’s consider where we’ve been over the past 12 months. To be frank, 2018 wasn’t a particularly bright year for gold and silver prices. Gold will finish with a slight loss; silver with a larger loss just shy of 10%. Sentiment toward metals got extremely depressed mid year. Speculators took out record short positions in the futures markets. Meanwhile, sales of American Eagles and other popular retail bullion products slowed to a trickle. By late summer, the money metals were making new yearly lows as the stock market headed for new record highs. But in September, the Fed went one hike too far. After monetary authorities pushed the Federal Funds Rate slightly above 2% (“neutral”), investors began to fear cascading negative effects in the housing, industrial, and consumer sectors. That fear – and the rotation out of stocks that followed – helped slowly reinvigorate safe-haven buying in precious metals. From late November through the end of the year, gold and silver prices rallied to multi-month highs. Momentum could carry forward to a strong first quarter of 2019. 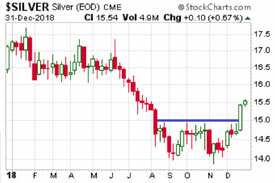 Silver looks especially interesting on the charts. Prices formed a long, drawn out double bottom base from August until Christmas week. Silver then broke out sharply through its $15.00/oz resistance level. The price action resembles an early stage liftoff from a launching pad. Silver is famous for its vertical moves, both to the upside and the downside. There is a good chance its downside was fully exhausted in 2018. One indication of just how depressed silver prices got: the silver:gold ratio hit its lowest point in a quarter century. Silver briefly got as low as 1/86th the price of gold. One trend to look for in 2019 is a narrowing of the price spread between gold and silver. The way that usually happens is that silver gains more than gold during rallies, so simply owning silver is a good way for most investors to play it. More sophisticated traders can try putting on long silver/short gold trades or selling their physical gold in exchange for silver.